A Kendall-Jackson winery in California is benefiting from both the heat and power provided by the sun through a solar cogen system developed by Cogenra Solar. "With solar cogeneration and the Cogenra system, the payback was much more attractive than photovoltaics alone, and the incentives on solar thermal are quite strong," says Robert Boller (left), vice-president of sustainability at Kendall-Jackson. The sun provides both light and heat energy, and California wine producer Kendall-Jackson, the second largest vineyard owner in the state, is working with renewable energy provider Cogenra Solar to take advantage of both forms of energy, while showcasing some breakthrough technology in the process. The company has installed the largest rooftop solar cogeneration array in the U.S. at its Kittyhawk winery in Windsor, California. It provides the winery with both solar power and hot water. The Kittyhawk installation was a test case for Kendall-Jackson, and given its success, the company decided to proceed with two additional, similarly-sized rooftop installations at its Vinwood estate in Sonoma County and another winery in Monterey County. The goal is to eventually install the technology at all 10 of its domestic and international wineries. There is also potential for project expansion at Kittyhawk, beyond its blending and bottling facilities. The 96-module, 241 kilowatt hybrid solar photovoltaic and thermal array supplied by Cogenra and installed by SunWater Solar will provide the Kittyhawk winery with 15 percent of its power needs and 60 percent of its hot water needs. The installation covers about 9,000 square feet on the winery's blending and bottling facility roof. 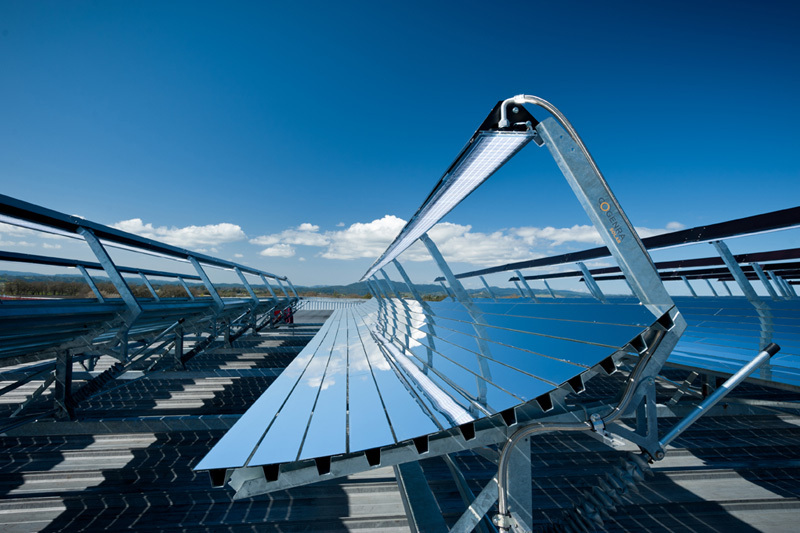 "With solar cogeneration and the Cogenra system, the payback was much more attractive than photovoltaics alone, and the incentives on solar thermal are quite strong," says Robert Boller, vice-president of sustainability at Kendall-Jackson. The winemaker has a long history of supporting, investigating, and implementing energy conservation and renewable energy opportunities. It has a three-step energy conservation program that first looks at how it can reduce energy demand from its processes, how it can re-commission or replace equipment with high efficiency equipment, and how it can invest in renewable energy either onsite or offsite. The company has conducted case studies for installing solar and wind projects at all its facilities. The Cogenra solar cogen technology was a good fit for Kendall-Jackson because of the nature of its manufacturing process. "We essentially are a food processor so sanitization is a key component of food safety in the quality of our product," says Boller. "Therefore, we use a lot of hot water. Being able to pre-heat that water with a solar cogen system and provide electricity as a bonus is a natural fit for us." Finding ways to increase the energy efficiency of solar power systems so that they can better compete with conventional power generation systems has been a major focus of the industry for decades. What is exciting about this combined solar power and heat recovery installation from a technological advancement point of view is that the system increases the energy conversion ratio of the solar system from 15 percent to 75 percent, says Dr. GiladAlmogy, CogenraSolar's CEO. Finding ways to increase the energy efficiency of solar power systems so that they can better compete with conventional power generation systems has been a major focus of the industry for decades. 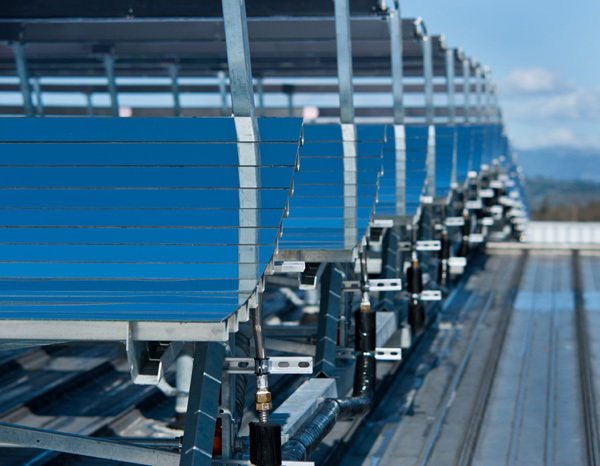 The combined solar power and heat recovery installation at Kendall-Jackson has been able to do exactly that, increasing the energy conversion ratio of the solar system from 15 percent to 75 percent. He adds that the technology has numerous potential applications in areas of the world that receive a significant amount of sun, for industries that need both power and large amounts of hot water in their processes. In addition to the wine industry, some examples are the milk and dairy products industry, meat processors, makers of personal care products, hotels, large apartments, laundries, and the processed foods industry. The company has completed a number of installations, including a project for another winemaker, a dorm building at the University of Arizona, projects for the U.S. Army and Navy, and the Facebook fitness center where the installation provides power and hot water for people to use for showering. "What makes a site a good fit for this technology is power production as well as the ongoing and continuous demand for heat," says Almogy. In addition to generating its own projects, he says that Cogenra would like to supply the equipment and guides and train other companies to market and install the system themselves. Cogenra is marketing concentrating photovoltaic thermal technology. The sun's rays reflect off mirrors that track the sun's movement and project the light energy onto downward facing photovoltaic (PV) cells. Each cell generates solar power while reflecting and concentrating the light to one location. The cells that capture the solar energy and convert it into electricity are black, silicon-based cells that emit a lot of heat energy. "What we do is flow a water/glycol solution behind these cells, which takes the heat away," says Almogy. "In the process, the cells are cooled down and the captured heat is used to heat the water for the winery." He says that improving the performance of the silicon-based cells from concentrated solar energy and developing the cogeneration array (which allows for both solar power generation and heating water) were the significant breakthroughs that Cogenra has developed and commercialized. "Mounting of these cells to a channel that flows water is very different than a traditional solar job," says Almogy. "What we invented was the system architecture. The economical coupling of the silicon cells to the heat collection element—that's the breakthrough that has enabled us to go from 15 percent to 75 percent efficiency." The water/glycol solution flows to the solar cells at 60 degrees Fahrenheit, and after capturing the heat energy from the sun, it is heated to 160 degrees Fahrenheit. The hot solution flows to a boiler where it heats water through the use of heat exchangers. Kendall-Jackson uses this hot water in its extensive tank and bottle washing operations. The system will produce about 1.4 million gallons of hot water annually for Kendall-Jackson. Boller describes the Cogenra technology as a brilliantly simple approach to solving an age-old problem of how to get the most out of the sun's energy. "They've put all the brain power into the thermal exchange between the PV and the water passing through the back of the PV. That's where all the intellectual property is really quite visible. The rest of the system is off the shelf." An important lesson Cogenra learned on the Kittyhawk project, which Almogy described as a huge improvement in the overall system, was how to draw a small amount of the generated solar power for operating the system that controls water temperature and flow and to run the pumps that circulate the solution through the heating system. Kendall-Jackson expects to save $30,000 annually in energy costs with installation of the Cogenra rooftop array and earn a payback on its investment within five years. It anticipates the same amount of savings from the Sonoma and Monterey installations. It took three months from the signing of the contract to commissioning of the system in December 2011. Almogy says the quick installation of the project is a reflection of Kendall-Jackson's previous experience working to improve energy efficiency and reduce water consumption at the winery as well as SunWaterSolar's experience as an installer. 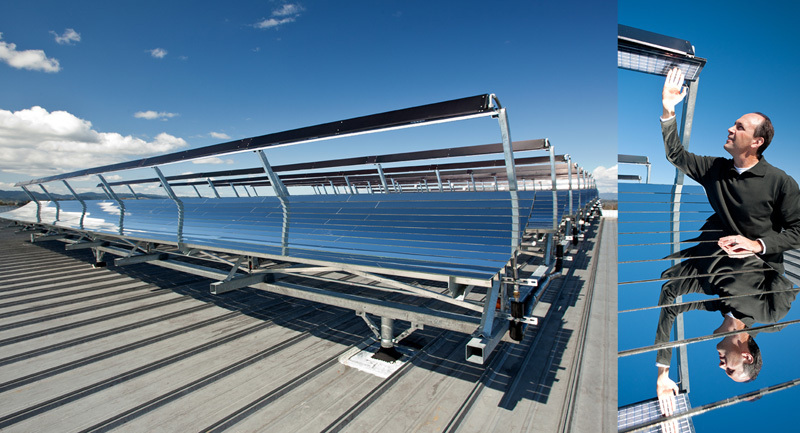 SunWater developed the design of how the hardware would be installed on the roof, installed the equipment, and also performed the work required to connect the solar power and water/glycol solution circulation system to Kendall-Jackson's facility. The system was installed and commissioned without any interruption to Kendall-Jackson's production schedule.